(Bloomberg) -- The Trump administration’s effort to persuade countries across the world to exclude China’s Huawei Technologies Co. from fifth-generation wireless networks isn’t going entirely to plan. 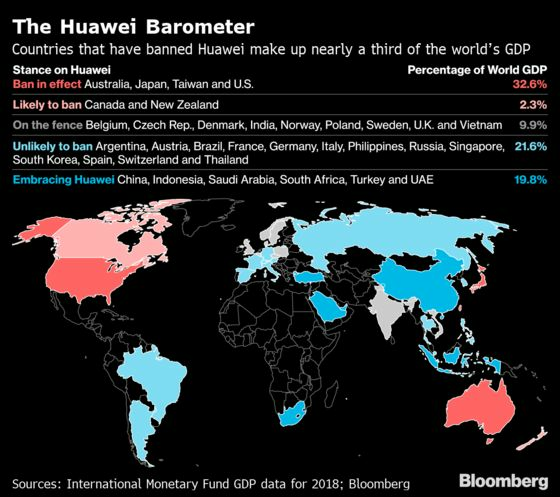 Nations accounting for more than 40 percent of the world’s gross domestic product are either embracing Huawei or appear unlikely to restrict the vendor. China’s President Xi Jinping, on a European tour this week, is expected to lobby further against bans in talks with French counterpart Emmanuel Macron and German Chancellor Angela Merkel. Dropping Huawei isn’t easy, especially in Europe, where the company has come from almost nowhere a decade ago to supply about a third of telecommunications systems. It’s positioned itself to be a critical provider of antennas, switches, routers, small cells and network slicing gear for 5G by conducting trials with carriers. The U.S. isn’t prepared to give up. It sent its point man on cyber security, Joshua Steinman, to Berlin last week. While Steinman expressed encouragement over measures proposed by German officials to protect the country’s wireless networks, he applied sharp pressure to make security a priority with Huawei, according to a person familiar with the discussion who asked not to be identified.